A shopper used several handsaws, including one powerful enough to cut through drywall, to "cut all the way down to the bone" on his arms. A man found in a pool of blood at a home improvement store in West Covina after he purposefully attempted to cut his arms with handsaws remained in critical condition Thursday morning, authorities said. 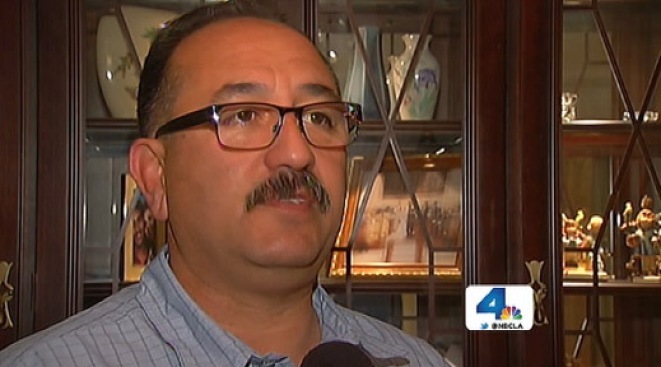 Pasadena Fire Captain Art Hurtado was among the horrified shoppers in the aisle Wednesday. He was shopping with his wife on his day off when he jumped in to help the victim. "We are always in work mode," Hurtado said. "As soon as I threw my keys to my wife, she knew saw the work and the stride that I had. And she knew, I'm working." Art and his wife Isabelle saw West Covina police officers rush to the man, and he joined them. "The officers had already found a man face down, multiple aisles, and the whole store is in chaos," Hurtado said. Hurtado said that as soon as he noticed the first saw, he "thought it was just going to be a crime scene and a fatality." Without gloves or any equipment, the 21-year fire department veteran began working on the victim. "I barely had a pulse and he was just barely breathing," Hurtado said. But Hurtado kept trying, using what was on the stores shelves around him. "I can save this guy, if I engage, that’s what we do," he said. "I started asking for a lot of towels," Hurtado added. "They finally showed up with a large packet of quarter inch rope, nylon rope. And I ripped it open and just stretched it out and I told the police officer I want 24-inch sections. Just start cutting." Lopez said the victim used several handsaws – including one that is used to cut drywall – to cut "all the way down to the bone." "It was a godsend," Lopez said. "He happened to be at the right place at the right time, probably saved his life." It was all in a day’s work, according to Hurtado. "Were we in a good place for it? No, but you improvise," he said. "You make things do. Like I said, if I didn’t have rope, I would have used my shoelaces. We would have made it work." Home Depot told NBC4 in a statement that it will cooperate with law enforcement's investigation.